These two cutie pies were born back on the morning of April 9th and are doing just fine. 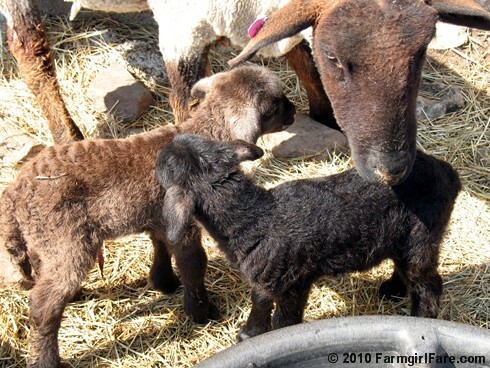 On the 8th, we arrived home extremely late from dropping my dear English pal, Betty Western, at the airport, and when I made my last lamb check about 2am, nothing much was happening (well, except for babies bouncing all over the place and keeping the moms awake). By the time I straggled back down to the barn several hours later, first time mother E-4 (yes, one of these days she'll get a real 'E' name, I promise) had chosen this cozy, sunny corner to have her twins. The next morning I walked down to the barn (somewhat earlier this time) and experienced deja vu when I saw Lucky Cherry with her newborn twin girls in the very same spot. 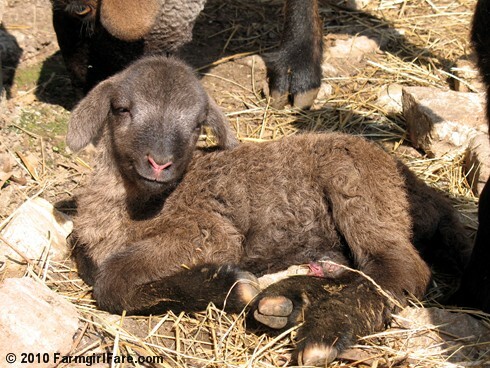 Safe and sound and soaking up the sun—such a beautiful sight to see during lambing season. 3/9/10: The 2010 Lambing Season Has Begun! © Copyright 2010 FarmgirlFare.com, the green and leafy foodie farm blog where these past few weeks of extra warm days means that there are blossoms everywhere you look and sweet new grass for sheep and donkeys to munch on (and for my hunky farmguy Joe to mow with the shiny new lawn mower we impulse-purchased yesterday while buying lumber for the new haybarn we start building Monday to replace the one that's falling down). It's the heart of hay growing season, but we really need a little less heat and a lot more moisture in order to get a decent crop. Please send some rain our way! How about naming E-4 Eleanor? It's such a lovely name. Oh, how dear is that smile on the new baby?! Oh! Oh! Oh! I can't get over it. I just can't. They are so cute! One of the girls I work with for my part time job just had a baby and named her Evelyn. I was just awestruck. That is an amazing name. Those lambs look so big to have come out of poor mama! I am so glad us humans have fairly small babies. . .
Just stopped by to see the cute lambs!!!! My husband's uncle and aunt bought a farm to "retire" on about 10 years ago "way down in Missouri" which takes about 3 hours just from St. Louis. So, when I view your site I think of them, and how the weather is there, etc. They have 15 head of cattle, not the sweet little lambs, but otherwise, it's probably a similar place. Thanks for making the blog so interesting, too! I loved the pictures! I wish I had twins just like them here...*sigh*. Can't even talk my macho logger tree farmer into a puppy, so I guess that would be stretching it. "E" names, huh? Well, now my brain is turning. Ellen? Ellie? Evie? Edie? Echo? Eden? Elvira...hmmmm...don't know about that one - it reminds me of a song! These babies are just so amazing! Your pictures always makes us smile. Thank you so much for sharing them with the rest of us! 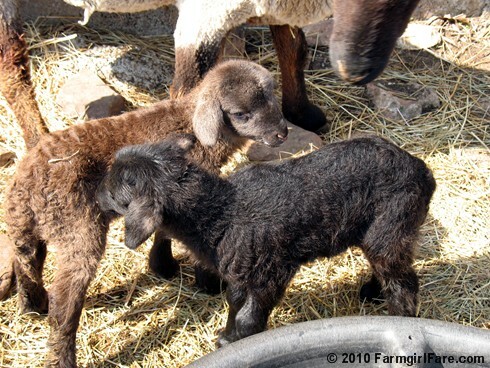 Nothing like spring lambs in the sunshine to cheer up a grey, rainy New England weekend -- thanks for sharing! Your blog is delightful -- you inspired me to slap together an apple pie before breakfast and do some serious planning for my vegetable garden (which entails a lot of unglamorous weeding and debris clearing). Thanks, and happy lambing! Friday Dose of Cute: Surrounded! Monday Dose of Cute: Getting to Know You. . .
Sunday Dose of Cute: Peep! Peep! Peep!